Create a truly user-friendly, top class menu for your website. Create a professional looking drop-down menu in minutes. No technical experience required! Make your menu with easy drag-and-drop functionality. With just one click, choose from numerous professional pre-built templates that you can customize according to your needs. 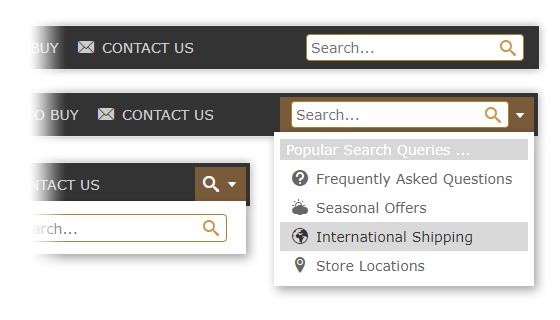 Set the desired appearance of the entire menu with a couple of clicks! Copy and paste the two-line menu code into your web pages. All that you need is a browser and an Internet connection. No programming or design skills are necessary. Creating a professional Menu has never been so easy! The menu, created by Menu Generator, meets all the requirements for professional website navigation. Menu structure can now involve multiple levels of hierarchy. This allows you to create the most effective and professional navigation system for your website. 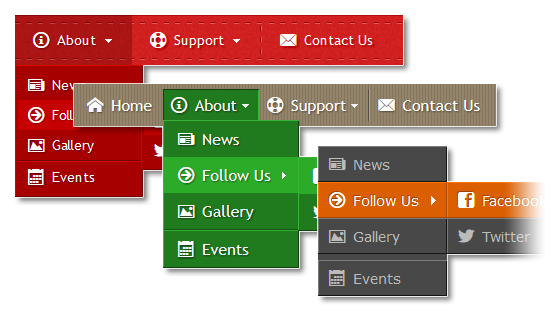 Website navigation menus generally come in one of two orientations: horizontal or vertical. Choose an orientation for your menu with just one click. If the submenu is a long list of elements, just split it into columns. 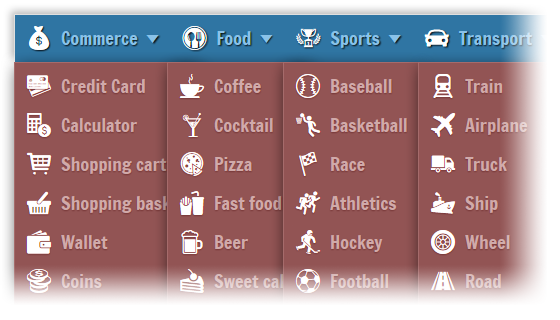 Add a vertical line between each column to make the layout more visually appealing. Menu Maker includes the set of 120+ most popular icons. 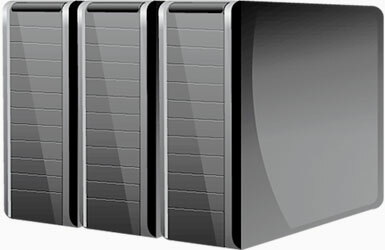 It contains the general icons, icons for social networking, multi-purpose icons and others. Use it or import your own icon set. The collection offers more than 60 most popular web fonts. Use of non-standard fonts will give your menu the attractive look that matches the theme of your site. Your menu is a smart system - it displays submenus on the available screen space. 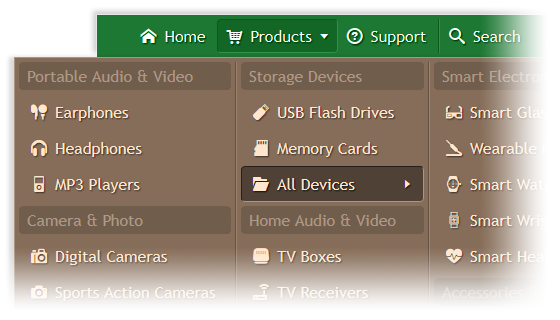 Submenus displayed over image rotators and Flash movies. Special repositioning logic prevents "stacking" for submenus. If the viewport width is less than the width of the menu bar, an alternate compact menu appears. The compact menu has support for expandable/collapsible submenus. Store your menu in our cloud and use copy-paste code to display it directly on your web pages. Any modification made to the menu in Menu Generator will be immediately reflected in the menu on your site. "I am glad I stumbled across Menu Generator as it is perhaps the best of its kind I have ever seen. 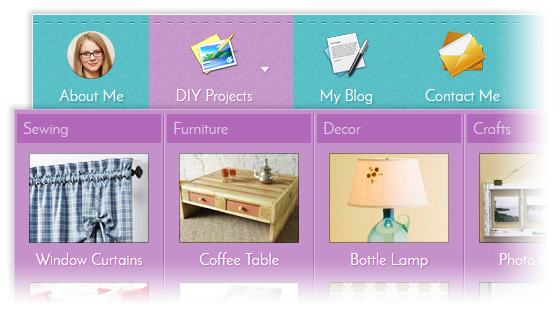 and even easier to add the menu to my website pages."